1. The most obvious ocular health concern that you'll spot is at the macula. See those yellow color distortions right in the center? Those are drusen consistent with dry age related macular degeneration. 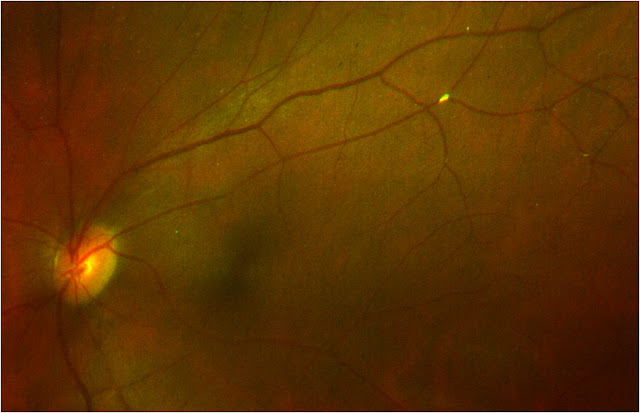 This patient came in for her annual exam with a known history of AMD that was being followed, so this macular appearance was expected. But can you see the new issue? 2. Follow the artery (the lighter colored blood vessel) up from the optic nerve and you'll come to a whitish round circle smack in the middle of the artery wall. This is a cholesterol plaque lodged in the arteriole, called a Hollenhorst plaque. Luckily you can see blood passing through the artery to the other side. If the blood vessel is white on the other side of the artery we know we have full obstruction and this would be an artery occlusion instead of just a plaque (occluded arteries are much more serious!). A cholesterol plaque, even when there is blood passing around it, is still a potentially serious threat to vision and systemic health; if there's a blockage in your eye there is likely a risk for cholesterol blockages elsewhere too. Cholesterol blockages or Hollenhorst plaques are often found without causing any vision symptoms, so this is just one more reason why routine ocular health checks with dilation or imaging is a vital part of everyone's preventative health care. The patient above had absolutely no vision complaints, and unless blood flow is being blocked, likely there will be no affect on vision. 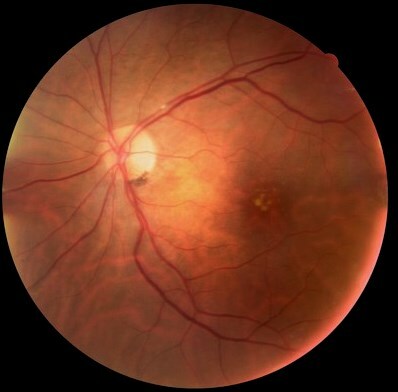 If there is a plaque limiting blood flow to the retinal tissue, the patient will likely experience blacking out of vision (called amaurosis fugax or transient ischemic attacks) that can last for minutes at a time. Any sudden vision loss is always worth a call to your eye doctor, even when it is painless! There is no active treatment for Hollenhorst plaques in the exam chair, but finding the cause of the blockage is the first line of action. Studies suggest between 45-55% of patients with Hollenhorst plaques have significant carotid stenosis (blockage) of the internal carotid artery on the same side as the affected artery. Your doctor will order a carotid doppler or ultrasound to detect the presence of stenosis. If you have been diagnosed with conditions like high cholesterol, high blood pressure, diabetes, or are a smoker you are at a much higher risk of getting these cholesterol blockages due to chronic damage to your artery walls. 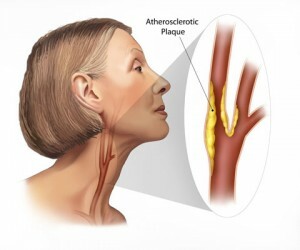 The carotid artery is particularly at risk for cholesterol plaque blockage because it splits into multiple branches right as it enter the base of the skull. The split into smaller passageways creates an area for cholesterol plaques to get lodged, constricting blood flow through the area. The carotid artery is very dangerous to occlude though -- it's delivering blood not just to your eye but to your brain so a blockage here could put you at risk for serious health issues and even a stroke. If your doctor finds carotid stenosis on your ultrasound, it will likely be treated with oral medications like anti-platelet/blood thinners (baby aspirin is a common one) and cholesterol lowering medication like the statin category of meds. Surgical treatment is sometimes required to remove the obstruction -- typically when the carotid is > 60% stenosed surgery is the preferred treatmetn method. While you might not notice any problems or changes in your vision, if a Hollenhorst plaque is found during your eye exam it's not to be taken lightly. The Beaver Dam Eye Study found that those with Hollenhorst plaques or any retinal emboli were at a 3 x higher risk of fatal stroke over the next 8 years. This is a finding not to be ignored, and just another reason that when you go to your eye doctor, you need to have retinal imaging and or dilation done every single year, even if you don't notice any problems with your vision. An eye exam is a snapshot of your entire systemic health, and using the retina like a window into your body's inner workings can save your life.